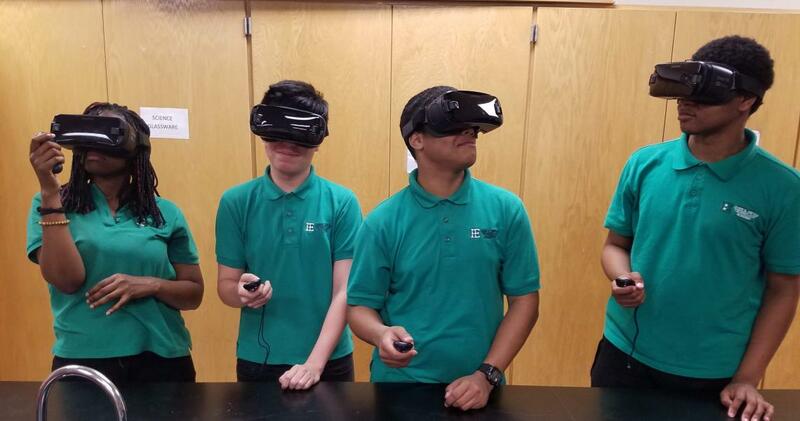 A group of students at Dwyer Technical Academy in Elizabeth, N.J. use virtual reality to explore atoms and molecules. A group of 11th graders traveled from their chemistry class at Dwyer Technical Academy in Elizabeth, N.J. to the center of atoms and molecules. Eager to explore this foreign dimension environed by electron orbits, the voyagers clutched atoms, felt them vibrate and got up close and personal with particles as they morphed into molecules. The students assessed radioactivity trends and learned the difference between solids, gases and liquids — and were back in time for the next class period. Obviously this field trip was simulated. But thanks to improved mobile virtual reality (VR) technology, students who don’t have a predilection for science are able to turn an abstract idea into an immersive learning experience. This unorthodox approach to assisted instruction required the use of a VR educational app created by Mel Science, which aligned with the curriculum and was downloaded onto a Galaxy smartphone. The phone, which snaps into the Samsung Gear VR headset, is operated by a remote controller using VR technology powered by Oculus. These tools enable solo, group and supplemental immersion activities that transport students to new dimensions and spur classroom discussion. Both VR and its close cousins, augmented reality (AR) and mixed reality (MR), are poised to expand exponentially, redefining consumerism along the way. According to researcher Global Market Insights, the global market for AR products will swell 80 percent to $165 billion by 2024. Last fall, the world’s largest retailer, Walmart, made headlines when it announced its interest to incorporate virtual shopping in its stores and websites. As VR reaches wider adoption, YWCC is adding two tracks of classes for immersive media and procedural content generation to its multimedia concentration within its information technology curriculum. These tracks of classes will cater to students with an interest in the extended realities (virtual, mixed or augmented reality), and 3D computer graphics. In September, Nersesian will return to Elizabeth to test the new education app he’s building with YWCC capstone students for a robotics class at Dwyer Technical Academy. Using the Oculus Go, the latest standalone headset to hit the market, Nersesian hopes to use visual simulations to help students better acclimate to the abstract skillsets of procedural thinking and programming concepts in the physical and hands-on learning environment of robotics.